If you are the type of person who actually folds their clothes, then you may have noticed that by the end of the week, your shirts in the drawer are quite a mess. Likely because you’ve rooted through them in an attempt to locate the exact one you were looking for. 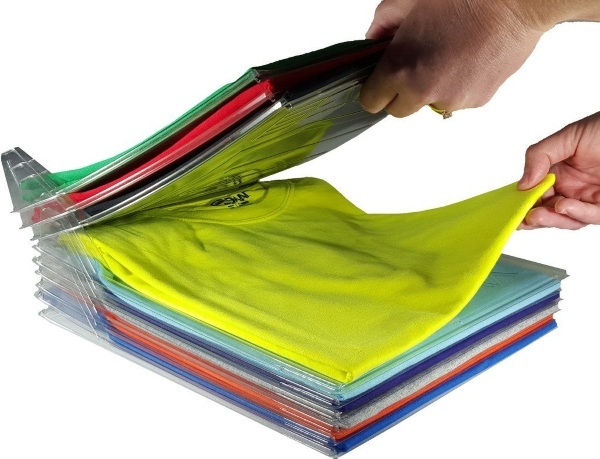 With the Closet Organizer and Shirt Folder, you can keep your shirts folded neatly for an easier time getting dressed. This device is like a stack of trays for your shirts. You can even use it as shirt folding board if you’re not so skilled in that area of tidiness. Once put onto the board, you can sort through the shirts and pull from the middle without messing up the ones on top. It’s a very simple system. These work in drawers, crates, and shelves. You can even toss them in suitcases. They’re made for shirts but you can put other clothes on them if you fold them up usually. Still, this is one step towards a neater laundry situation. You can get a 20 holder for $21.99.